Karen Epp, Senior Finance and Accounting Recruiter at Goldbeck Recruiting, is a small town girl with a big heart. 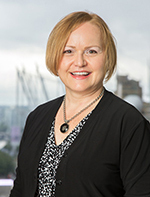 She grew up in Regina, Saskatchewan, went to the University of Regina, and now brings over 20 years of recruitment experience to Goldbeck Recruiting in Vancouver, BC. Karen was a typical good girl that followed her heart and made her own path. In her childhood and teenage years, she participated in everything that had to do with sports, community, music, and social activities. At that time she did not have many career choices, being from a small town. A good girl either became a teacher or a nurse; however, she wanted to fall out of the norm and be in the business world. She first started working in administrative jobs and then took a strong interest in sales. A natural 'giver', she particularly enjoyed sales in service oriented industries where an important part of the job was supporting and understanding what peoples' wants are. This led her to look into emerging recruitment firms in Vancouver and so joined Holloyway Schultz where she started her recruitment career. After more than 20 years, she joined Goldbeck Recruiting to launch its new Accounting & Finance recruitment division. She has successfully placed individuals at all levels of accounting, and serviced companies in a wide range of private and public sectors including not-for-profit. Her focus has been to understand her client's business, its structure and staff culture to meet immediate and long term needs. Karen lives by her motto: 'work hard, learn hard, and be open to new experiences.' She created a new defining moment in her life when she adopted a daughter from China and became a single mom. By then she had developed a strong reputation as an Accounting and Finance recruiter . It was her solid career in recruitment that supported her and her daughter. In her own way she compares recruitment to home life 'in the kitchen'. The kitchen is where everyone gathers before, during, and after the meal -- a place to socialize and connect with others. What she finds fulfilling about being a recruiter is being able to share insights and ideas, bring people together, and create successful long lasting relationships. Karen remains loyal to both her family and clients as they are to her.